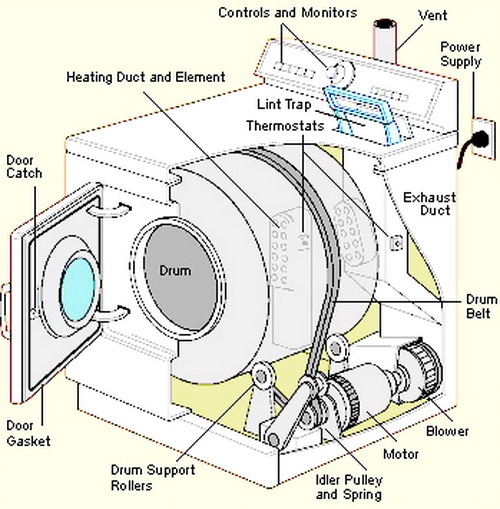 Here is a fast troubleshooting guide for repairing your Clothes Dryer. Use the guide to repair your dryer whether it is a front load or a top load. The repair methods below are meant to be used for all clothes dryers. If you are still having trouble with your dryer after using the troubleshooting guide below, go to our homepage to ask an appliance repair question and ask your question in complete detail to help us assist you to fix your clothes dryer. I have a Kenmore 90 Series Dryer (Model 11060942990). When the push-to-start button is pressed the dryer turns on but will not stay on when you take your finger off the push button. Also, it does not appear to heat if you hold the start button on for 1 minute or two. I have watched your videos (Thanks !!) and I have checked the resistance for the Hi-Limit Thermostat, the Thermal Cutoff, the Thermal Fuse, and the Push-to Start Button — all are good. I have replaced the Motor Relay with a new one. Still the same problem persists. Can you tell me what might be wrong ? ?